RealWorld Designer based applications contain one or more Window layouts. A layout represents a usage scenario and there is usually at least one layout per document type supported by the application, but there may be more. Layout management window can be accessed using the main menu command Tools->Manage layouts. This command is only visible if access to layouts is enabled in Application Options window. 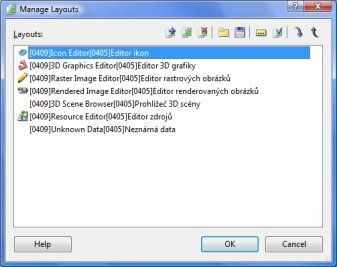 The dialog lists the available layouts and allows duplication, creation, deletion, export, import and configuration of individual layouts. Layout names are stored in the multi-language format. Features requested by the views used in the layout / features offered by the document. Position of the layout in the list (see the screenshot). If the first criterion did not find the best layout, the layout higher in the list is chosen. When document is being opened the selection process is the same with one exception. If the document was used recently and the type of the document is the same (you have not forced the document to open as text, etc. ), the application will recall the last used layout (it must be still available, of course).